By smallsat in Space Flight/Orbital Mechanics on January 29, 2013 . 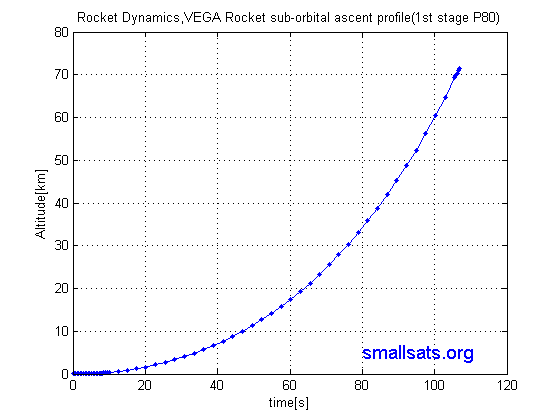 When do you show “The full sub-orbital ascent profile simulation coming soon !!” ? I run your code, and i plot(x,h) and appear that you did something wrong, because it’s doing a gravity turn upside down., i.e. the x and y axis are changed! You right. I will double check and modify the post.Thanks for pointing this out !! I’m not sure about that. I think it should be considered somehow. If you launch from equator the speed relative to inertial frame 463 m/s should be there. Thats why most of launch sites are close to earth’s equator. I also checked the code again. The axis seems correct. 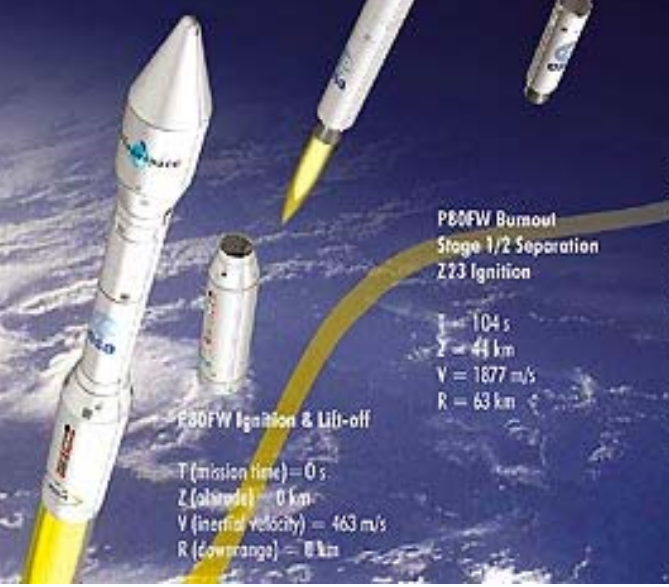 Also refer to the http://www.arianespace.com/launch-services-vega/VEGAUsersManual.pdf may be it will helpful. See the picture i uploaded above. The rocket data after the burn of first stage. I assume the difference could be the drag coefficient. I just assumed Cd = 0.5 a constant value. Hi,Thank you for your program. during the run of program it occure a error at line 74,75,79 and 85.
it is strange Sahep. Several people run it without an issue including me :). Did you created a RocketDynEq.m function in a same folder ? hi . thanks for your web. They have some examples and codes to look at …I’m quite busy lately but let me know how it goes .. i can try to be helpful !